Discover, explore, and settle Catan anywhere and anytime!...even solo! The Catan Dice Gameâ„¢ is a fast, fun way to experience Catan on-the-go. Play it in only 15-30 minutes! It's a great casual introduction to the world of Catan. With 6 colorful, high quality, embossed plastic dice, a generous pad of full color double-sided score sheets featuring two maps for alternate play, and an exquisite lidded leather dice cup. the dice cup will hold dice, rules and score pad. Roll your way to victory. So get ready to toss! Challenge the odds and discover a fresh way to master Catan! 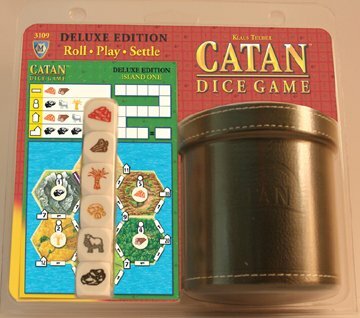 all* you need for a very cool, quick Catan adventure! Psssst! - Dice, rules and score sheets will store inside the dice cup, secured safely by the lid for ultimate transportability.